Most everyone knows the common garden vegetable known as celery. Celery seeds are another part of celery that one should be aware of. They have a strong but pleasant odor and are commonly used in soups, pickling, and dressings. The seeds of celery pack have several health benefits. Celery is thought to have been cultivated as early as 850 B.C.E. in the Mediterranean region and there are records from the 9th century A.D. mentioning its use medicinally. Celery happens to come from the same family of vegetables as carrots, parsley, coriander, and fennel which may help explain the shape of its leaves! While celery stalks are pretty much a guaranteed find at any grocery store, you may have to do a little more searching for the seeds. Celery seeds are easily found online or in the seasoning section of your local grocery store. How CAN celery seed help my health? While celery stalks are pretty well known for its fiber and micronutrient content, its roots and seeds contain a higher concentration of beneficial constituents. One of the more important benefits of celery seeds is because of its cancer-fighting ability. It has some active components that are helpful in fighting cancerous tumors such as polyacetylenes and phthalides. The other significant health benefit of celery seeds is that it helps in managing the blood pressure levels and regulate cholesterol . Having celery seeds everyday helps in promoting good blood pressure levels. Celery seeds are known to have anti-inflammatory agents. Having celery seeds everyday helps in treating pain and inflammation of the joints. Having celery seeds every day helps with inflammation-related ailments such as gout, rheumatism as well as arthritis. They may have synergistic effects with Non-Steroidal Anti-Inflammatory Drugs improving their inflammatory action while at the same time protecting the stomach. Celery Seeds stimulate the uterus and helps in easing muscle spasms, especially related to the female reproductive system. 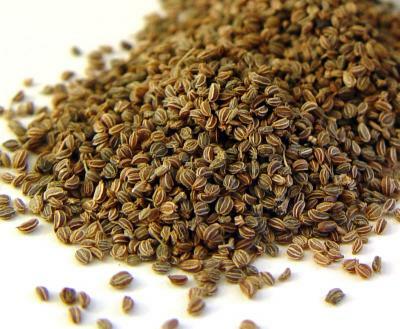 Celery seeds are helpful in easing menstrual cramps and pains. If women have it on everyday basis, it may help ease the symptoms of menstrual discomfort. As the celery seeds are diuretic in nature they are recommended to people with kidney stones, water retention, as well as gout. Celery seeds do not permit extra accumulation of uric acid as well as fluids in the human body. Celery seeds are antibiotic as well as antiseptic in nature. Celery seeds may especially be helpful in infections of the urinary tract. You can add dried celery seeds to your food, this will help enhance the spicy flavor and make your food more nutritious. If you have low blood pressure levels, kidney inflammation or birch pollen allergies, celery seeds should be avoided as well. While the seeds themselves are edible, some people can be allergic to them. You should also avoid them if you are pregnant as they can cause premature uterine contractions.